108 blocks, in 6 colors and with 6 different shapes. Create and expand lines of color and shape strategically in order to score the most points. Place all the tiles in the bag. Each player draws 6 tiles and places them that no other player can see them. This is your deck. Find the player with the most tiles sharing one characteristic. That player plays those tiles in a row or column and the number of tiles is the score for that first turn. Add one tile to the grid and draw a tile to bring your deck again to 6. Add two or more tiles to the grid. 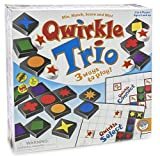 All tiles played must share one attribute (color or shape) and must be placed in the same line. The tiles must not all have to touch each other. Again, draw tiles until your deck has 6 tiles again. Trade some or all of your tiles for different tiles. All tiles must connect to the grid and form a line of two or more tiles. A line is either all one shape or all one color. Tiles that are added to a line must share the same attribute as the tiles that are already in that line. If your are unable to add tiles to the grid on your turn, you must trade in some or all of your tiles. Set aside the tiles you want to trade, then draw replacement tiles. Finally, mix the tiles that you traded away back into the bag. When you create a line, you score one point for each tile in that line (including the tiles that already existed on the grid). When a tile is part of two different lines, it will score 2 points. 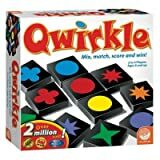 You score 6 bonus points whenever you complete a line of 6 tiles, which is called a Qwirkle. Lines of more than 6 tiles are not allowed. When there are no more tiles left, the play continues as before but players don't replenish their decks at the end of their turns. 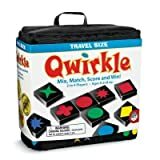 The first player who uses all of his tiles ends the game and gets a 6 points bonus.